Several months into our year in this room, it’s time for a check-in. There’s no probationary period for new residents at Beacon Hill Friends House (no cracks, please, about how lucky that is for us). But the time seems right to ask how it’s going. There’s nothing like returning from a trip to provide a snapshot of how you’re feeling about the place you’re returning to. And our return from Vienna earlier this week prompted at least a couple of feelings about life at BHFH. 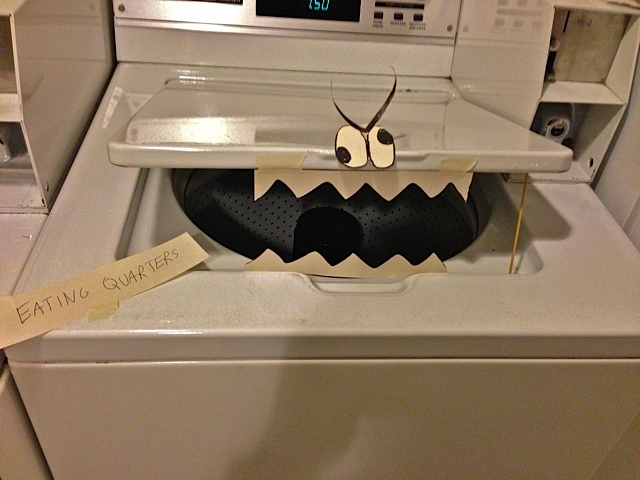 Heading for our room, I passed through the laundry room and was confronted with a clever but disturbing creation decorating the washer. The alert that this critical appliance was “eating quarters” instead of washing clothes was not the best news for someone with a week’s worth of dirty laundry. Appliances broke when we lived on our own, of course. The good news about broken appliances at BHFH: Arranging the repair is someone else’s responsibility. The bad news? Arranging the repair is someone else’s responsibility. Which gets me to one of the things that both needs work — and is changing — about our life in this intentional community. As spoiled customers of long-term Sears warranties, our experience with broken appliances typically involved a quick call, a short wait and a no-extra-charge fix of whatever needed repair. As one of 21 residents in a house run by staff of three, our role in restoring laundry service is limited to a hope and a prayer. But what’s changing about this situation goes well beyond our reduced influence. The more interesting shift involves how we feel about giving up control over when we’ll once again enjoy clean underwear. The journey from one feeling — irritation that not everyone shares our level of urgency about getting the damned washer fixed — to a more laid back view of life and laundry turned out to be pretty quick this week. I’d no sooner come to terms with not being able to get Sears on the phone — or that lonely Maytag repairman, for that matter — when the washer was fixed and some extra quarters came our way as compensation for the wait. Not every instance of relinquished control will arrive at such a happy ending. We’ll keep you posted on those, too. 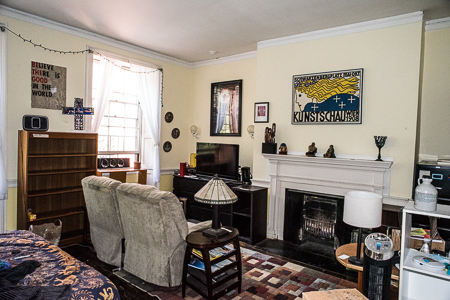 The best reason for moving into Beacon Hill Friends House is a commitment to living in an intentional community. Luckily for us, the BHFH community has turned out to be a great fit. We like the people we’re living with, we like the systems that facilitate the day-to-day lives we share, we like the physical space of the house. And we like living on Beacon Hill, despite those treacherous bricks on the sidewalk. The main challenge we’ve faced so far has less to do with the community and more to do with the two of us. Picture two people with somewhat erratic sleep patterns co-existing in a 16 by 18 foot space in ways that accommodate simultaneous middle-of-the-night reading and typing by one along with the peaceful sleep of the other. Hoping for advice in the comments area below. Speaking of the counsel of friends, the red flag you waved most concerned the shared bathroom down the hall. After moving from a home equipped with a separate full bath attached to each of four bedrooms (which seems really excessive in retrospect), finding our third-floor bathroom occupied when we need it can prompt a twinge (or hurried step) or two. Especially when the bathroom on the other side of the third floor is also engaged. In about 100 days and nights at the house so far, though, I’ve encountered a third unavailable bathroom only once. You’ll be relieved to learn I survived without incident. Perhaps the most interesting change, for me, involves the Talking Rock. Among the mandatory requirements of living at BHFH is participation in a twice-monthly house meeting. Convened in the house library at 7 p.m. on Sunday evenings, the meetings are conducted with both the rigor and soft hands of Quaker gatherings. They are scheduled to conclude two hours after they begin, a commitment honored with room to spare in each of the half dozen or so meetings we’ve participated in so far. Each meeting begins with Talking Rock, an approach to group sharing I’d never encountered and was not especially excited about. Whoever happens to be seated closest to the rock’s home on the library mantel grabs it and describes what’s happening in his or her life in two minutes or less (the beep from the timer on the clerk’s smartphone can be ignored when it needs to be). All of which adds up to about 45 minutes of sharing, the sort of experience I feared could quickly enter the world of TMI. It turns out that what’s too much information for one approach to life is just right for another. The more I get to know my fellow housies, the more I like Talking Rock. Which, of course, is how I’m getting to know them, at least a couple of times a month. I’m still trying to understand my changing feelings about the rock routine. But I think it has something to do with the difference between the way I started out absorbing these two-minute stories — from a stance of observing and judging — to the way I find myself listening now, which has less to do with assessment and more with affection. We’re hoping you’ll post your questions or comments about our life at BHFH so far in the comments below. 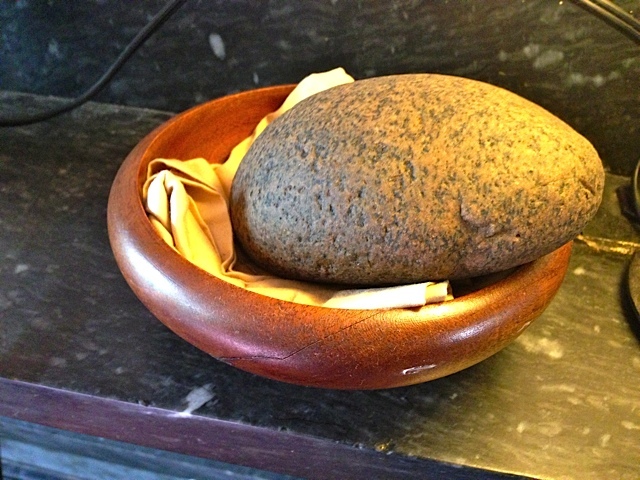 This entry was posted in Community and tagged Beacon Hill Friends House, Posted by Bill Mitchell, Talking Rock. Bookmark the permalink. It is a fair share discussion, Susan. But we all pay the same flat rate for food — about $320 a month each for five prepared dinners a week and stocks of food for us to prepare ourselves for other meals — and surely the consumption of food varies from person to person. Guessing that washer/dryer discussions will continue. Talking Rock is easily my favorite part of House Meeting. I would like a deeper connection with people. I choose to live in community for that purpose. Talking Rock is just a taste of that. I wish we spent more time as a House really getting to know one another. Our hopes. Our fears. Help each other grow, etc. Granted, not everyone is interested in that sort of work but it feels so weird when people leave the House with barely a good-bye. Stuff like that makes me feel like I’m in a boarding house rather than a community. Point well taken, Ryan. Talking Rock seems to give all of us a sense of where each of us is at in some depth. Limited depth, granted, but more than we’d have without the rock. It seems to create a foundation for the less weighty conversations that a half dozen of us participated in just now as we scrambled our breakfasts together. But I’m intrigued by your idea to build the wherewithal for deeper friendships into house systems. If some in the house would like a deeper edition of Talking Rock, seems like something worth accommodating. Hi there, my name’s Rachel and I was a resident of a double room at BHFH in 1999-2000. Just came upon your blog via the BHFH FB page. Anyway, I was wondering if you’d tried white noise machines in your space?